Please note Utsav Lal -Hindustani Classical on piano with Enayet Hossain Khan on Tabla occurred in past. The concert will feature solo piano renditions of Dhrupad-influenced Alap-Jod-Jhala. 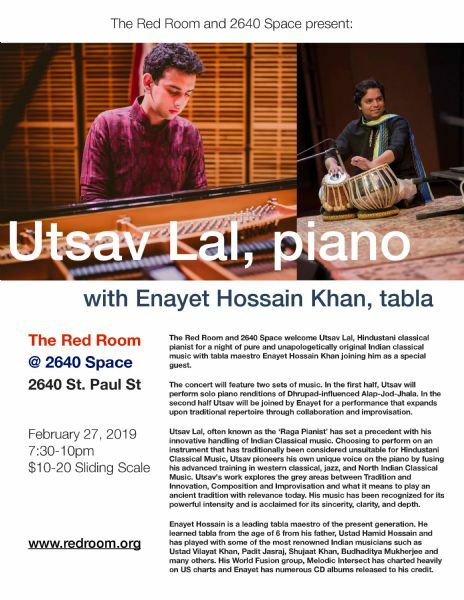 Utsav Lalwill be joined by Enayet Hossain Khan in the second half which will include traditional compositions featuring a dialogue between the two musicians. The music flows between a pure yet unapologetically original take on raga music and reinterpretations of traditional repertoire which absorbs the multidimensional outlook of both artists with simplicity, intention and grace. Instead of focusing on binaries, the work aims to explore the grey areas between Tradition and Innovation, Composition and Improvisation and what it means to play an ancient tradition with relevance today. This will be Indian classical music as never heard before. Utsav Lal, often known as Raga Pianist' has set a precedent with his innovative handling of Indian Classical music. Recognized for his unique creative vision, the 26 year classical & jazz pianist has an impressive career which includes performances at global venues like Carnegie Hall-NYC, Southbank Centre-London, Kennedy Center-Washington DC and extensive collaborative work with Celtic, Indian, jazz and improvising musicians. 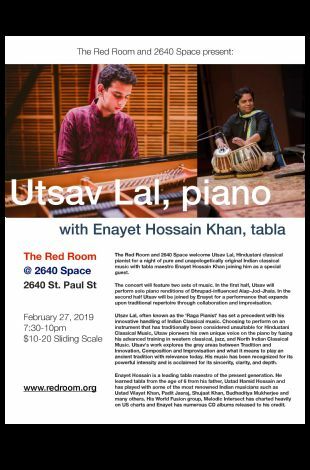 Utsav tackles the limitations of the piano confronted with this ancient improvisational tradition through inspiration from his guru Ustad Wasifuddin Dagar (of the legendary Dhrupad Dagar family which goes back twenty generations). He also gains inspiration from a vast array of sources such as the Persian piano tradition, the work of Australian minimalist piano trio - The Necks and musicians who sought to expand the expressive capabilities of the piano like Ran Blake, Anthony Coleman, Tsegu-Maryam Gubrou Cecil Taylor and the work of Helmut Lachenmann. Utsav Lal blends his diverse influences to create his own unique voice on the piano. His music has a powerful intensity and is acclaimed for its sincerity and depth. Enayet Hossain is a leading tabla maestro of the present generation. He learned tabla from the age of 6 from his father, Ustad Hamid Hossain and has played with some of the most renowned Indian musicians such as Ustad Vilayat Khan, Padit Jasraj, Shujaat Khan, Budhaditya Mukherjee and many others. His World Fusion group, Melodic Intersect has charted heavily on US charts and Enayet has numerous CD albums released to his credit.